As “periodontal” means “around the tooth,” periodontal disease attacks the gums and bone that support the teeth. If not removed, daily plaque turns into calculus, or tartar, and this destroys gums and bone. At Carolina Dental Arts, we help our patients diagnose, treat and maintain their periodontal disease in North Carolina at our locations across the state. This common dental problem is the primary reason for tooth loss, and research shows that there may be links between periodontal disease and strokes, diabetes bacterial pneumonia, cardiovascular disease and increased risk during pregnancy. Smoking also increases your risk for periodontal disease. Bleeding gums. Healthy gums should never bleed, even when you brush vigorously or use dental floss. Loose teeth. This occurs when bone loss or weakened periodontal fibers no longer support the tooth. New spacing between teeth. This is also caused by bone loss. Persistent or chronic bad breath. Gum disease is the leading cause of bad breath, as bacteria in your mouth can create unpleasant breath. Pus around teeth and gums. Pus can indicate the presence of an infection. Receding gums. This involves gums moving away from your teeth. Red and puffy gums. This is a sign of unhealthy gums. Tenderness or discomfort. Plaque, calculus and bacteria irritate the gums and teeth. 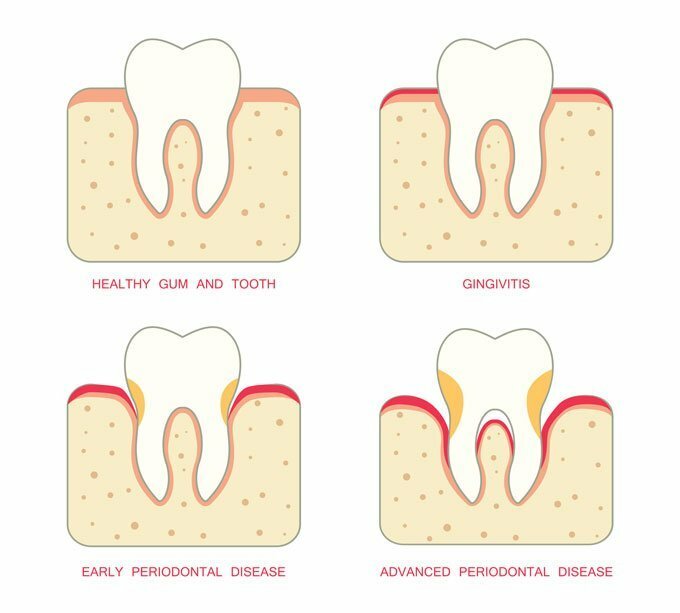 As the first state of periodontal disease, gingivitis occurs when plaque and its byproducts irritate the gums, making them tender and inflamed and causing them to bleed. With periodontitis, plaque hardens into calculus, or tartar, and as it builds up, gums begin to recede from the teeth. Deeper pockets form between gums and teeth, and these spaces are filled with bacteria and pus. The gums become very irritated and inflamed and bleed easily. This may cause slight to moderate bone loss. The teeth lose more support as the gums, bones and periodontal ligament continue to wear away. Unless treated, the affected teeth will loosen and may be lost. Generally, moderate to severe bone loss is present. Our NC dentists base our periodontal disease treatments on the severity of the disease. If the disease is caught in the early stages of gingivitis and no damage has been done, it’s likely we will recommend two regular cleanings and give instructions on improving your daily oral hygiene habits and scheduling regular dental cleanings. If the condition of the periodontal disease is advanced, we will perform a special periodontal deep cleaning and disinfection called scaling and root planing. This procedure is completed one half of the mouth at a time. The section is numbed, and tartar, plaque and toxins are removed from above and below the gum line, and rough spots on root surfaces are smoothed. If the pockets do not heal after scaling and root planing, our dentists may suggest periodontal surgery. Did you know it only takes 24 hours for plaque to turn into calculus or tartar? If you are prone to periodontal disease, regular cleanings at home are especially important for your dental health. After scaling and root planing treatment, our dentists recommend that you come in four times a year to one of our North Carolina locations for optimal periodontal disease maintenance ito keep your gum disease at bay. At these appointments, our team will carefully check your teeth and remove plaque and calculus from above and below your gum line. We also will take X-rays, examine existing restorations and tooth decay, and provide an oral cancer screening and teeth polishing. The team at Carolina Dental Arts is dedicated to the dental health of our patients, and we strive to keep your gums and teeth free of periodontal disease. If you are spotting signs of periodontal disease, don’t hesitate to contact us and schedule an appointment at your nearest location today. Want more information about treating periodontal disease? Our staff members would be happy to answer any questions you may have.